First Place – Brandon Chickanosky from Hesperia, CA. Trout weighed 3 lbs. Caught using Salmon/Peach Power Bait. 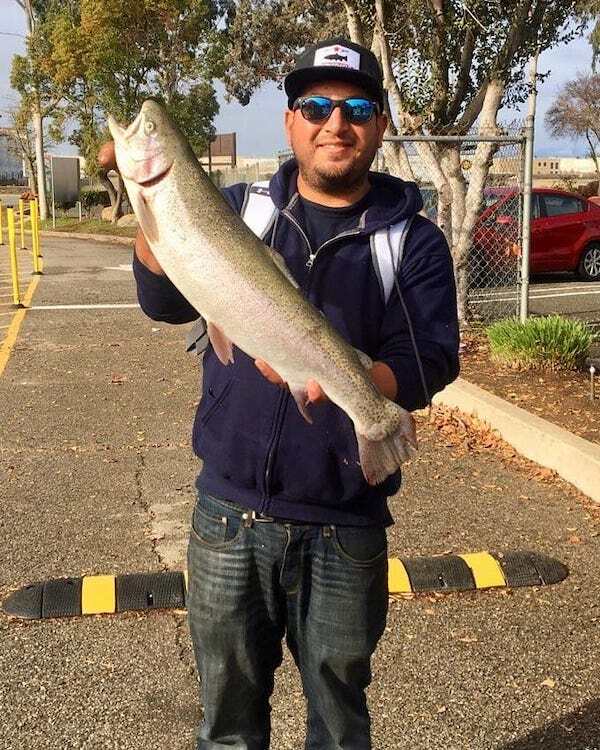 On Saturday, February 9, 2019, 102 young fisherman attended the San Bernardino County Regional Parks Trout Derby for Kids. The derby was held at Yucaipa Regional Park in Yucaipa, CA. A total of 120 trout were caught and registered, with the top trout weighing in at 3 lbs. It was caught by 13 year old Brandon Chickanosky from Hesperia, CA using Salmon/Peach Power Bait. Twenty-four additional prizes were given out for trout weighing 2 lbs. 14 oz. to 2 lbs. There was even a prize for the smallest Trout caught which was won by 15 year old Ian Winden from Yucaipa, CA with his 3 oz. Trout. Second Place – Brandon Chickanosky from Hesperia, CA. Trout weighed 2 lbs. 14 oz. Caught using Salmon/Peach Power Bait. Fifth Place- Alex McKenzie from Redlands, CA. Trout weighed 2 lbs. 7 oz. Caught using a jig.